A person consumed with a burning desire becomes very creative to fulfill it. This is normal human behaviour. When people gifted uses creativity to secure the dreams of people not personally known to them, it stands apart. Allennott, a gifted artist from Thiruvananthapuram, Kerala, is unique. He uses his creativity to proclaim solidarity with the oppressed. Unlike those who just watch and comment, Allennott translates his feelings into his art, thus serving a cause in the best way he can. As per Archeological evidences and studies, human inhabitation in Tibet traces back to 12000 years BC. The first Tibetan Fortress was built in 416 BC. In 620 AD, written form of Tibetan language took shape and Tibet as a country was unified. With minor ups and downs, it remained a free sovereign country until 1959, when ironically-named People's Liberation Army (PLA) invaded Tibet forcing His Holiness the XIV Dalai Lama seek refuge in India. Since then, everything that is Tibetan is being systematically destroyed and defaced. Not only the Tibetans are reduced to a minority due to forcible immigration of Chinese citizens to Tibet, but their cultural heritage is now fading into oblivion due to propagandist initiatives. Even the photograph of His Holiness the XIV Dalai Lama, whom people of Tibet regard as the reincarnation of Buddha, is banned inside Tibet. The rich cultural wealth is brought to naught. A peaceful country is trampled over by brute force and violence. Since February 2009, 130 citizens gave expression against this oppression and human rights violation through the supreme sacrifice of their own lives. Freedom… much more precious, more valuable than life itself. Allennott and "Shirt on Red Hanger"
Allennott is an artist. He spends his time between India and Europe, working on his painting assignments. 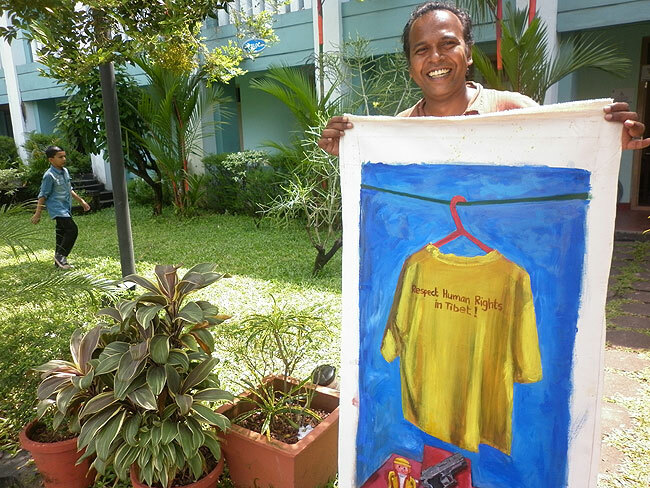 His paintings, "Shirt on Red Hanger" were made during 2008 Olympic protests. Not many people knew the artist, yet these paintings were the most widely-used images by Tibet Support Groups (TSGs) in India. In recognition to the contributions of Friends of Tibet in highlighting the Tibet issue, Allennott donated two of these paintings, during his visit to the Wellbeing Camp, Kochi. "It is through a life immersed in art that I recognise the bonds that affect my existence.This recognition sets me free. As Time brings about changes that pose new challenges, each painting is an answer to the question  "Who am I ?" When Form, Expression and Time get embedded on space, the concept of surface is no longer there. The name given to me, became my enemy; for it did not have the scent of my own earth. When the name turned into a symbol, I saw the sounds of valiant struggles, power games and subjugation." As an artist, he believes he can't shirk away from the responsibility of lending his voice to society. He lent his voice to the Tibet Cause through his paintings, "Shirt on Red Hanger". Like many of his other works including his popular ones like "Coca Cola Bridge", "Shirt on Red Hanger" is very symbolic, and pricks our conscience: a peace loving nation is being painted red against its will, ideologically as well as literally (with its citizens' blood spilt all over), while all the 'protectors' of Human Rights remain mute spectators. When Might is Right, Justice is only a matter of expedience and Human Rights is no longer a prime agenda. The Shirt continues to hang on the Red Hanger. Allennott uses his art to stand up and tell the world that things are not right in Tibet. Like him several individuals all over the world are raising their concerns over the fate of Tibet. Will such individual actions fetch any result? Definitely; because, as rightly pointed out by His Holiness the XIV Dalai Lama, "Global change begins with individual action". Friends of Tibet, over the last 15 years, have launched many programmes to create awareness about the Tibet Issue. Wellbeing Camp is a unique initiative in that direction. Rather than orations, the camps showcase the richness of Tibetan medical system derived over centuries of experiments and revived by His Holiness the Dalai Lama. Over the past three years since it commenced, the camp has more than 1800 participants registered and attending the Wellbeing camps held in Kochi organised joinlty by Friends of Tibet Foundation for the Wellbeing and Men-Tsee-Khang. At a time when people of the city were fed up with the scorching heat and highly stressed out, Dr Dorjee Rapten Neshar and his medical team brought about the much needed shower of health and wellbeing, spreading an aura of positivity. At Ashirbhavan, Kochi, the four-day camp saw about 250 participants reaping benefits of this unique and effective healing system. With the kind support of our benefactors, many financially challenged people were given free medicines. A surprise hartal (a general strike) and heavy downpour dampened the spirits of Kochi, but the Wellbeing camp continued to work towards wellbeing of its participants with participants and volunteers pouring in as usual. Quoting Tharanath AK, one of the Wellbeing Volunteers, "Comparing the happiness that we feel while doing something for a noble cause, the difficulties are immaterial".